and see pictures of what I won. 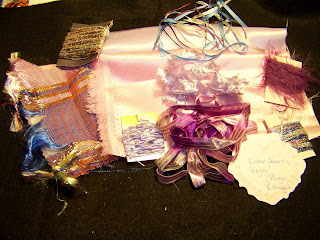 I received Wendy wonderful package today and I thank you so much Wendy I love everything, the fabrics, thread, cards. What a great package to receive in the mail. I would have posted my own pictures, but my cameras are packed. We are heading out in the morning for a getaway. We are first visiting John's 87-year-old mom for 1-1/2 days in San Diego, and then Saturday we set sail for Hawaii. Hope to have a lot of great pictures when I get back. done while I am gone. My work has been crazy lately, and I meant to post these last week. 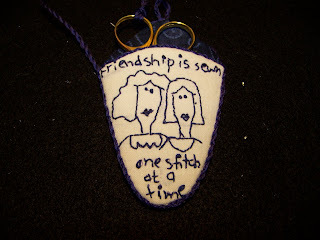 I love to shop Pat Winter's Etsy shop. I actually got these several weeks ago. 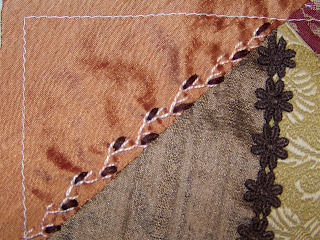 I love her hand-dyed silk ribbon and ordered these and they came with some silky images on fabric. I ordered the pansy one and the butterfly, they came with 2 of the ribbons. Pat, dear friend that she is, gave me a few extra. She also gifted me with this lovely crazy quilt pendant she made. If you haven't had an opportunity to visit Pat Etsy shop, it is a wonderful experience. She has silk ribbon she has hand-dyed, she has bliss kits which include the silky images, beads, ribbon, she has her CQ book which she published, and she also has jewelery, purses she has made, and also eyeglass cases. I have been trying to get swaps and RRs completed before our vacation next week. 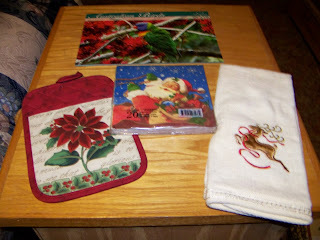 And this is Gail's CQ RR stocking, from the small CQ RR I am in with a small group of friends, Moira, Susan and Gail. 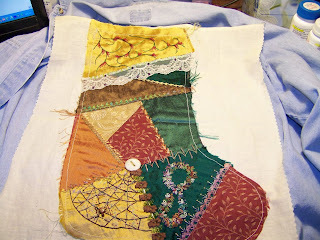 Gail is making a stocking for her daughter. 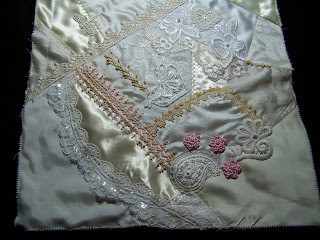 This side, I worked on everything from below the lace to above the button. This had previously been stitched on by Susan and Moira. 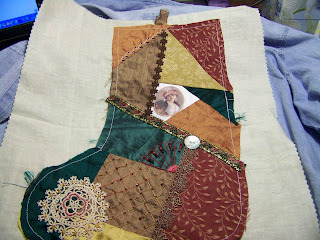 The coppery seam is the one I worked on on this side. I sent this off to Gail last week. She is hoping to finish it up before Christmas. My friend Karen South shared her chili recipe several days ago, and has invited us to share our own recipes and link back to her. She is going to have a drawing in several days for some CQ goodies, I was not going to do this, mainly because my recipe is in my head, and I don't measure anything. I generally make up a huge batch of chili, and share it with my 2 daughters, and freeze some for later. This recipe is the ingredients I put in it, not quantities. Browned Italian sausage, I generally buy bulk but links can be taken out of casing. Garlic 1 clove diced and browned with the meat. I just mix everything together and simmer for 3-4 hours. I have been working on a number of things I cannot show pictures of, including my present for the person I am Secret Santa to, in the Chookyblue 2008 Secret Santa Christmas Swap. I finished my present, and I just need to package it up with a few other items. This was another Lotto block, the monthly swap I am in with a small group of friends. 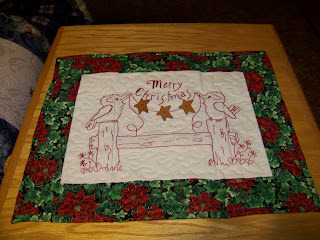 October was also Captain Nancy's month and she sent us this fabric to make her the Swamp Angel block. I finished it up and sent it off to her. And this is Susan's CR RR block, from the small CQ RR I am in with a small group of friends, Moira, Susan and Gail. I worked on the polka dot seam, and the one below the stripes. Another view. I also stitched around the love block and below it. It is really hard for me to get my lighting right so I can get a decent picture. As I mentioned in my prior post, yesterday was a wonderful squishey mail day. My postal lady Victoria also had her eye on this package. 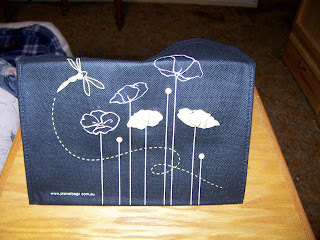 Last month, my friend Rengin was having a drawing to celebrate her 50th birthday, with "50 pieces of goodies". While I did not win that prize, 2 other people's names were chosen to win a small baggie of goodies. Well my package arrived yesterday and it was a pretty huge 3 baggies of goodies. There was this one with assorted charms, fabrics, beads and threads. 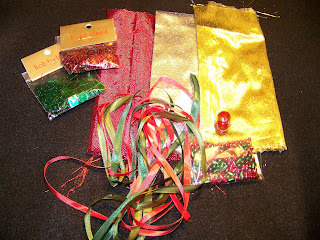 And another baggy with these Christmas colors of fabrics,beads,ribbons, and sequins. Thank you so much Rengin, your package was another that added to a really good day! 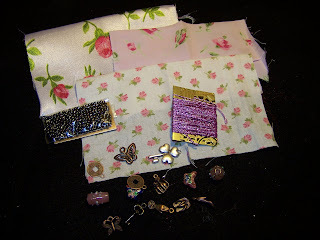 I will really have a fun time using all these wonderful embellishments! Stitcher's Angel, Inger Lise from Norway. I read this post the other day, and was wondering if that was my package being mailed off. Well it was! It is hard to see from these pictures, and the background I used this morning, but she made all my items in a dark blue, and blue just happens to be my favorite color. There is this cute little scissors holder, complete with scissors! She had the packages neatly numbered on which way to open them but I forget which was which now. But there was a cute bag with my name on it too! 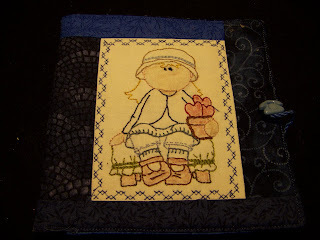 And then there was this needlebook, also really nice. 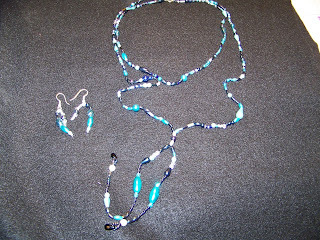 a necklace and earrings too! I love everything Inger Lise, and truly appreciate everything you did! You made my day! Thank you again! I just found out about another giveaway. Zana offers, in her words "paint the portrait from a photograph supplied by the winner. The size of the portrait will be 9.5" x 11" and is painted using quality materials." The giveaway is a portrait of 1 child or infant. Wendy is having a giveaway here for her 100th post. 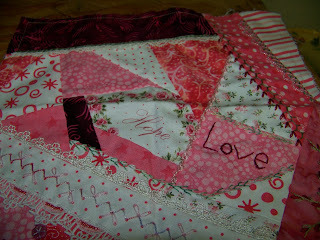 CQ blocks to go in a crazy quilt to benefit breast cancer that Leslie Ehrlich is putting together. 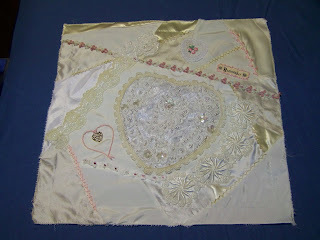 The quilt is constructed of donated wedding dresses in white, ecru and cream. We were allowed to use light pink and gold. This is my first block. I am sending this off in the mail today. This is my second block. I had a really tough time taking good pictures of this light block. Yesterday's mail brought a little package from Barb of Happy Handwork. She had a giveaway recently. While I was not one of the winners of the giveaway, I was one of the lucky winners of the extra names she chose, and this is what I received yesterday. 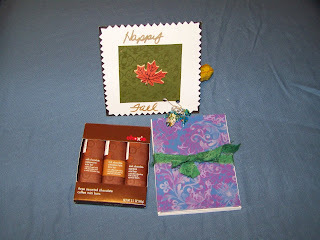 A cute fall card, some lovely note cards and chocolate! Thanks so much Barb! 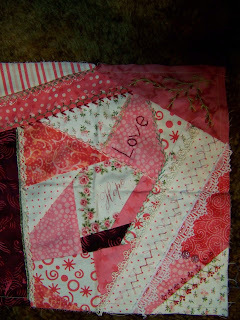 There is a great quilt giveaway that ends today, 10/17/2008 here at Pigtails and Snails. There is another giveaway here at Ocean Wave Quilts. There is a signed original art work that is matted and framed, giveaway here for breast cancer awareness. I am hoping I win this for my granddaughter. The drawing is November 1st. 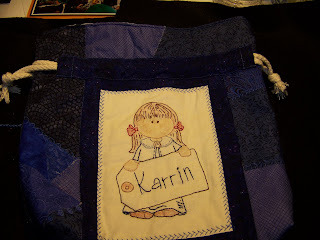 This is my third gift I made for my Stitcher's Angel recipient. 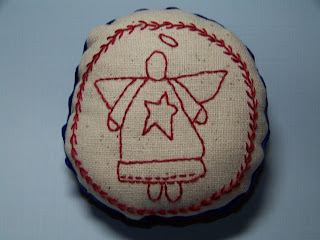 It looks like a Stitching Angel to me. I made it into a pincushion. It was actually an ornament kit from my local quilt shop I had not made up yet from a number of years ago. I sent my package with all 3 gifts off to my recipient last week. 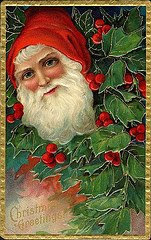 I plan to make some ornaments for my daughters in the next month for Christmas with this pattern. Several weeks ago, DH was browsing the flyer from Harbor Freight, and telling me what he was interested in buying, and items they had. He came home, and showed me all he had gotten. He mentioned something else he had thought about getting, but didn't want to spend the money. 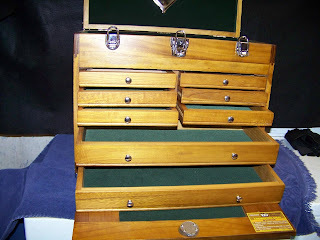 tool chest, that is lined in felt, and had a number of drawers inside. me the tool box, and told me it was my Christmas present but I could have it now. 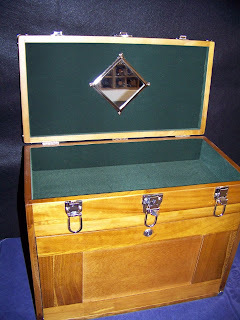 Of course, last night I didn't fill it up with tools, but threads, ribbons, beads, etc! I love it. Plus it has locks on it so I can lock it when the grandkids (especially the little guys) come over so they don't get tempted. I got rid of 3 plastic containers last night as I was able to get the contents in this. I have been busy with a lot of things. 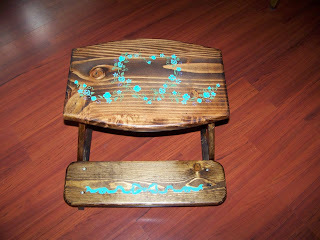 DH built a stool for Kyleigh, our granddaughter to climb into her new bed, which is rather tall. 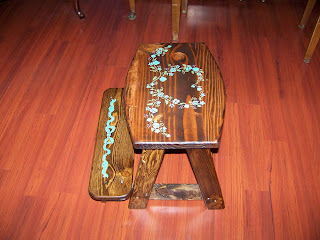 He built it, I stenciled it to coordinate with the new color of her walls. I belong to a small list of quilting friends and we have been participating in something called Lotto. We used to send around fabric, and have a drawing at the end of the month and someone won all the blocks for that month. Recently, we have been choosing a month, sending around fabric, and your block request, and the participants send you the blocks back you can then assemble into a quilt. 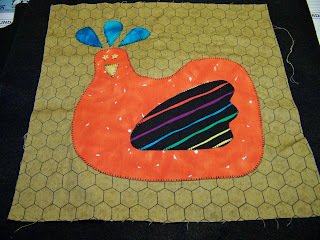 September was DeeJae's month and she requested that we finish up these funky chicken blocks for her. 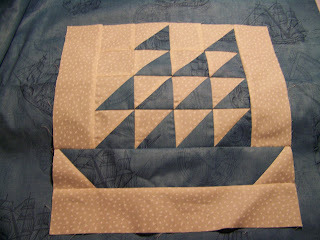 October is my month, and I am requesting participants make this sailboat block. 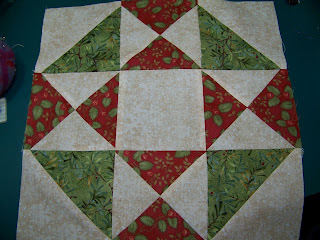 I got the pattern from here, at Quilter's Cache. These are 12" blocks. There are 12 participants in the swap. I intend to make a quilt for our king-sized bed, so DH figured I needed 42 blocks. 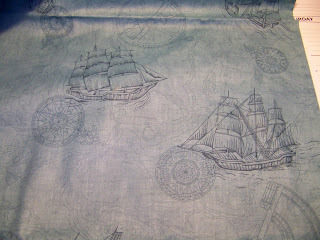 I plan to mix in some dark colored blue ships too, and I think it will be pretty scrappy. 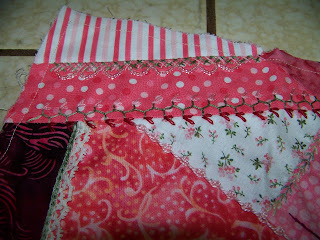 I am going to use the rest of the fabric I have left over for the borders.